I’ve Tweeted, Voxed, blogged, and bragged about it. Last year it turned out to be one of the highlights of my day. I surprised parents at work, made some cry, and even got to tell a few in person about it. And, I’ve witnessed other educators start to do it. The “it” I’m talking about is the #GoodNewsCallOfTheDay. I’ve shared my story with others about starting the #GoodNewsCallOfTheDay hashtag last school year. 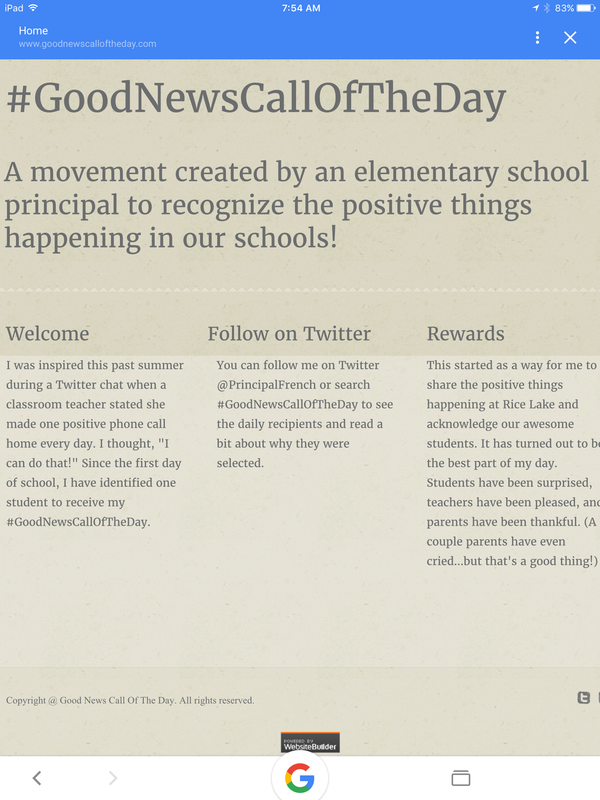 During the summer of 2015, in a Twitter chat, I was impressed when a teacher mentioned she made a positive phone call home for one of her students each day. I though, “I have 650 students and can certainly find one a day who deserves a positive phone call home.” Thus, the #GoodNewsCallOfTheDay was born. Last year I made 130 #GoodNewsCallOfTheDay phone calls home. I tried to make one each day I was at school, but admittedly, I missed some days. I kept a spreadsheet of the date, student’s name, grade level, and teacher because I wanted to be sure I was reaching out to all grades PreK-5th and touching all classrooms. I chose most of the students based on something I observed or because of a relationship we had developed. It might have been something I saw them do or say in the hallway, classroom, cafeteria, the front of the school, on the bus, or on the playground. Sometimes I’d ask a teacher for a recommendation of a student who needed a boost or recognition. It took about 10 minutes to go to the classroom, announce the name of the student who was getting the #GoodNewsCallOfTheDay, bring them to my office, and make the phone calls. I also took a selfie with the student and posted that on Twitter. 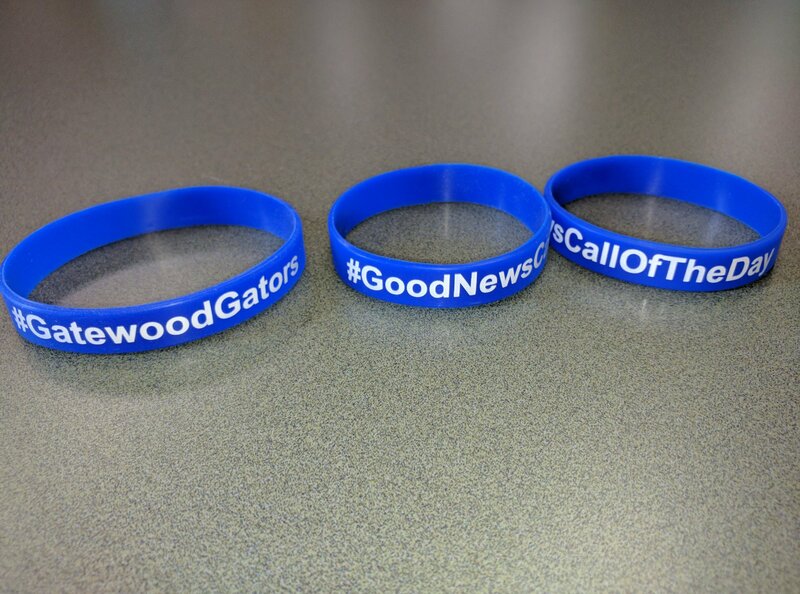 This year I’m giving students a #GoodNewsCallOfTheDay wrist band as a remembrance. I’d call whoever the student wanted and I would try work, home, and cell phone numbers. Most of the time we got to talk to one or both parents but sometimes we left a message. If we left a message, I would circle back with the student the next day to see what their parents said. On the rare occasion where I could not locate a working phone number, I sent an email message. This turned out to be the best part of my day and I’m looking forward to continuing this practice at my new school. This will give me a chance to get to know the students, develop positive relationships, and share the great things our students are doing. I removed the “Reserved Parking” sign at my new school this summer. Having a reserved parking spot for me, the principal, didn’t feel good. I have seen these signs at other schools and I never understood them. I’ve seen reserved parking for a staff member of the month and I think that’s a cool idea. But, I don’t need one as principal. I don’t need a parking spot that sets me apart from my building colleagues. I can walk from where all staff members park. Why are my parking needs more important than anyone else’s? I had the reserved parking spot removed to make another parking space available in front of the school for parents. I like parking farther away from the front doors for the exercise, fresh air, and visual perspective it gives me. I’ve noticed many things like parking lot lights, driving habits, school signage, sidewalk care, and curb appeal on my walk into school. 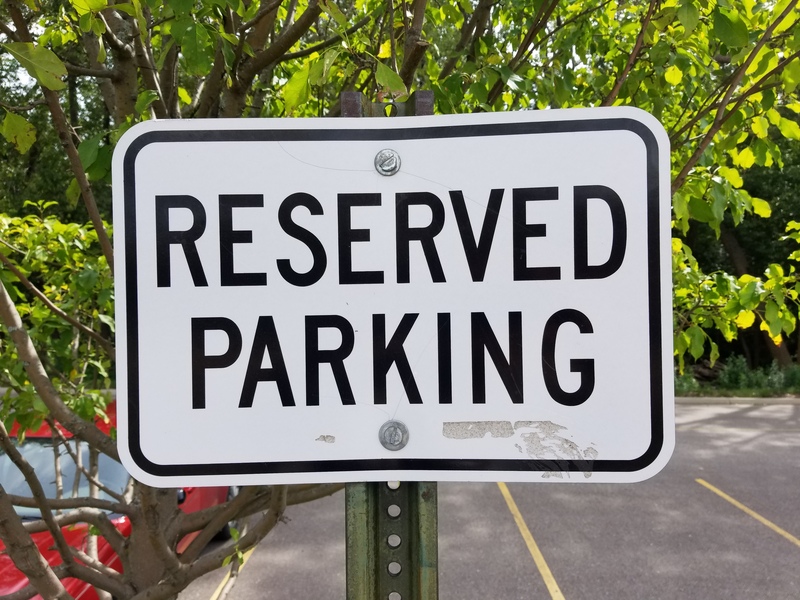 Join me in removing any “Reserved Parking” signs that still exist. It’s Back-To-School Shopping For Me, Too! I am starting my 35th year as an educator and, if you count my K-12 and college years, I have been back-to-school shopping for 52 years! And, I still get excited by shiny shoes, new clothes, crisp notebooks, colorful Sharpies, and my latest obsession, Pilot G2 pens. I have always said that this career is a good match for because because I love the cycle of a school year. There are always endings and new beginnings. While I do enjoy back-to-school shopping in August (July is just too early for me! ), some of the things on my back-to-school list can’t be found in any store. My back-to-school shopping list includes: reflection, learning, and rejuvenating. I spend time reflecting on things that went well and things that can be improved. I started in a new district and school July 1, 2016, and I offered to meet with staff members to reflect with them. 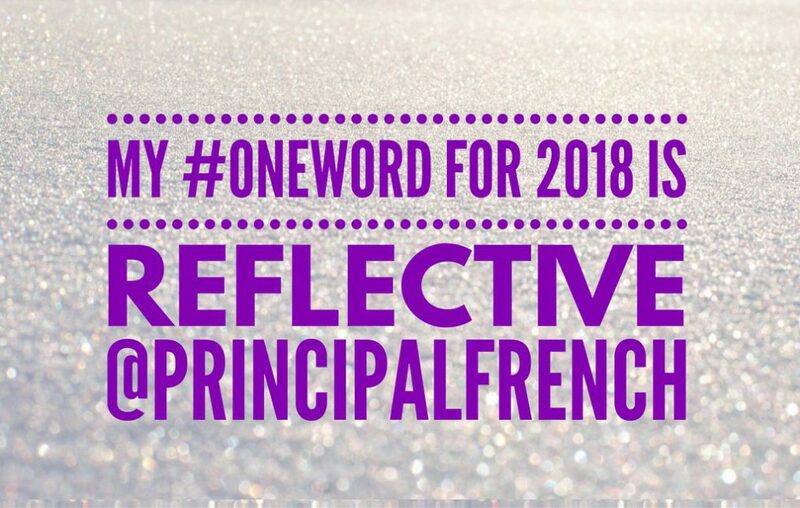 Fifty staff members took me up on that offer and it has been valuable for me to reflect on my practices and beliefs in order to consider goals and priorities for the coming year. I spend time learning as I prepare to go back-to-school. Some is formal learning like reading books and attending the National Association of Elementary Principals conference and Restorative Practices training. Other learning comes from my PLN through Twitter chats and in Voxer groups. Being connected with other educators is great learning for me. One of the most important things on my back-to-school list is making time for rejuvenating. I say a happy, healthy principal makes for a happy, healthy school. Enjoying time off, connecting with friends and family members, being active, and exploring my passions are important for me. Summer is a good time to start healthy habits like exercising and practicing better nutrition that hopefully will continue into the school year. Don’t get me wrong, I still enjoy going back-to-school shopping and finding a good bargain on colorful socks, shoes, shirts, and ties that attract students’ attention. And, I get just as excited as some students do for the start of school. I’m already trying to decide on my first day of school outfit! Dave Burgess, Teach Like a Pirate, inspired me to find my passion. Fellow educators modeled the value of blogging. In 2015, I combined my passion for cooking into a blog at http://www.principalwhocooks.wordpress.com. My goal that year was to select a different cookbook each week and document my adventures with new recipes. I enjoyed that challenge and found ways to connect lessons with cooking to my work as an educator. I’ve been thinking about reviving PrincipalWhoCooks to get back into the blogging habit. Last weekend I gave myself another cooking challenge. 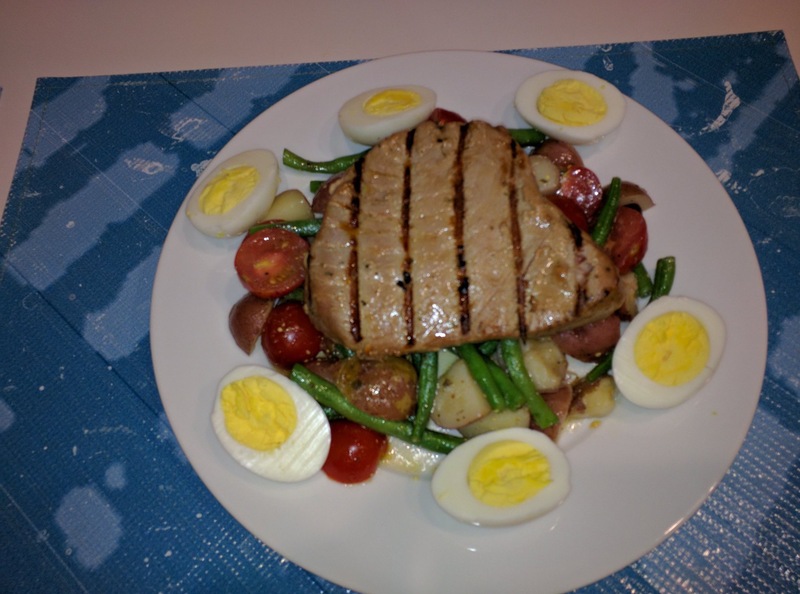 We had tuna steaks to use so I looked up Salad Niçoise recipes (I knew the recipe was for a salad with tuna) and I came across a recipe by one of my favorite chefs, Tyler Florence. I have watched Tyler on the Food Network in shows like The Great Food Truck Race, Tyler’s Ultimate, Food 911, and How to Boil Water. His recipes and cooking style are easy to replicate and I have some of his cookbooks in my collection. Back to Salad Niçoise. I followed Tyler’s recipe and documented the final result. The dish turned out quite well and I Tweeted photos thanking @TylerFlorence. Well, I was surprised and shocked when Tyler responded to my Tweet later that evening. 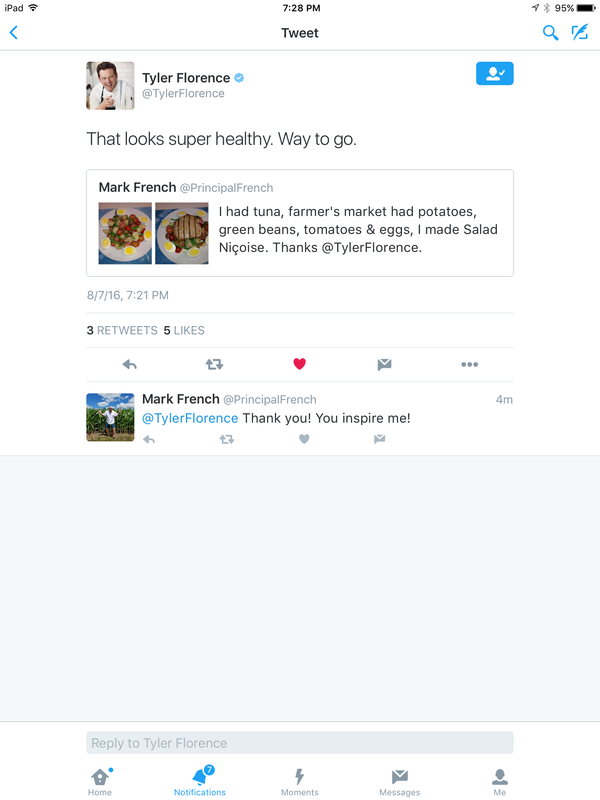 Tyler Florence responded to me! You never know how following your passion, writing and reflecting, and being connected will reach and affect others. So, watch for the revival of PrincipalWhoCooks. 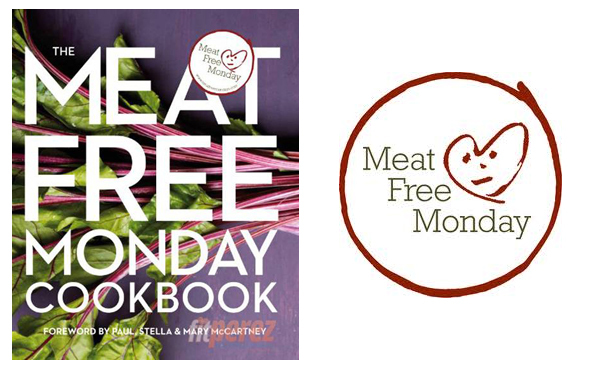 For next year’s cooking challenge I’m conisidering using The Meat Free Monday Cookbook written by Paul McCartney and his daughters. I need to get into healthier eating habits. Who knows, maybe I’ll get a Twiiter message from one of The Beatles next year. A guy can dream, can’t he? 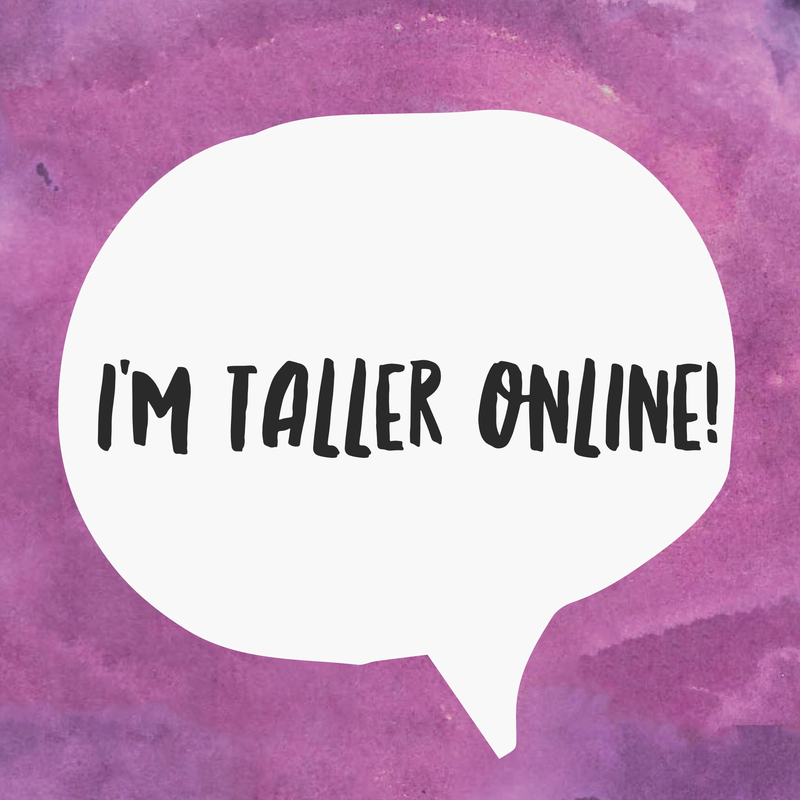 Sometimes, when I meet a PLN member from Twitter or Voxer in person, I use the line, “I’m taller online!” This is an attempt at humor and to recognize that sometimes people look different in person than their photo or online persona. I love meeting people in person I have connected with online. This started at EdCamps here in the Twin Cities area a few years ago. At first, I was star struck when I saw a person I was following on Twitter. Will they recognize me? Am I worthy? But, every in-person meeting experience has been powerful, positive, and enlightening. Isn’t it amazing (or strange) that you can feel closer and more connected to people you only know online than to people in your building or district? I’ve been fortunate to meet members of my PLN in person at the 2014 and 2016 NAESP national conferences, at our MESPA Winter Institute, at EdCamps, and while traveling. I visited @Jonharper70bd (Maryland), @_AndyJacks (Virginia), and @Mr_B_Teacher (Virginia) while attending conferences in DC. I was honored to be invited to their homes to meet their family members. I connected with a fellow elementary principal in Portland, Oregon, while visiting my family last spring break. And, I have taken the opportunity to meet up with fellow Minnesotans like @GustafsonBrad, @focus2achieve, and @JeffVizenor1 to learn from them and extend our connection. I even got to meet @benjamingilpin and @TechNinjaTodd at Brad Gustafson’s doctoral graduation celebration. I’d love to take a sabbatical to visit members of my PLN around the country, tour their schools, learn from them in person, and document my journey. I haven’t figured out a way to do that yet but maybe I can accomplish that when I retire. You should find opportunities to meet members of your PLN in person and, I guarantee, it will take your connection to a whole new level. Oh, and if you meet me in person, I’m 5’7″ in height, but I’m taller online! For a variety of reasons, I changed school districts and schools for the coming year. I am now the proud principal of Gatewood Elementary in the Hopkins, Minnesota, Public Schools; the district I live and vote in and pay taxes to. In my 35 year career as an educator, I have always said one of my favorite things about my work is there is always an end to the school year and a fresh start to the new year. That sentiment is more pronounced for me as I ended an 18 year career in one school system and started a brand new one in another. Boy, you sure learn about yourself making this kind of change. You learn about your priorities, your virtuosities and strengths, and about areas in which you need to grow and develop. I made an offer to all staff members in my new school to meet with me so I can ask three questions: What are you proud of? ; What should be maintained? ; and, What could be improved? Many staff members took me up on my offer and I have enjoyed listening to and learning from them. I realized that I have not taken the opportunity to do this since I started in my previous school eleven years ago! I recognized I need to make this talking, listening, and connecting a regular part of my practice, and not just when I move to a new school. So, if you are an educational leader thinking about your practices, consider meeting with, listening to, and learning from your stakeholders. It will give you a perspective of things you may not be aware of and it validates the voice and input of others.